Numerous variations are found in wild Amphiprion clarkii, probably due to some degree of reproductive isolation of certain populations throughout its wide geographical distribution. Variation exists with respect to any combination of three characters—body color, caudal fin color, and the number of stripes. Body color includes yellow, tan, and black. Caudal fins can be white or yellow. The number of stripes varies from 2 to 3, while stripes may sometimes be inconspicuous. This species naturally lives among the tentacles of pizza anemones (Cryptodendrum adhesivum) Bubble-tip anemones (Entacmaea quadricolor), Sand anemones (Heteractis aurora), Sebae anemones (Heteractis crispa), Magnificent anemones (Heteractis magnifica), Malu anemones (Heteractis malu), Long-tentacle anemones (Macrodactyla doreensis), Giant Carpet anemones (Stichodactyla gigantea), and Carpet anemones (Stichodactyla haddoni and Stichodactyla mertensii). This natural behavior protects wild clownfishes from predators. Without anemones hosts, some large wild Amphiprion clarkii can be shy or easily frightened. 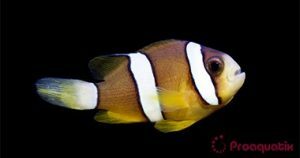 Proaquatix clownfishes do not require anemone hosts but will accept them if present. Range extends from the Arabian Gulf to Fiji, as far north as Japan, as far south as Maldives, and as far west as Australia’s Great Barrier Reef and New Caledonia.